Mount Everest , also called Sagarmatha (Nepali meaning Head of the Sky ) or Chomolungma ,Qomolangma or Zhumulangma (in Tibetan: is the highest mountain on Earth, as measured by the height of its summit above sea level, which is 8,848 metres (29,029 ft). The mountain, which is part of the Himalaya range in High Asia, is located on the border between Sagarmatha Zone, Nepal, and Tibet, China. The highest mountain in the world attracts climbers of all levels, from well experienced mountaineers to novice climbers willing to pay substantial sums to professional mountain guides to complete a successful climb. The mountain, while not posing substantial technical climbing difficulty on the standard route (other eight-thousanders such as K2 or Nanga Parbat are much more difficult), still has many inherent dangers such as altitude sickness, weather and wind. By the end of the 2007 climbing season, there had been 3,679 ascents to the summit by 2,436 individuals. Everest has claimed 210 lives, including eight who perished during a 1996 storm high on the mountain. Conditions are so difficult in the death zone that most corpses have been left where they fell, some of which are visible from standard climbing routes. The Tibetan name for Mount Everest is Chomolungma or Qomolangma which means "Saint Mother"), and the Chinese transliteration is Zhumùlangma Feng (which refers to Earth Mother; the Chinese translation is Shèngmu Feng which refers to Holy Mother. In 1865, the mountain was officially given its English name by the Royal Geographical Society after being proposed by Andrew Waugh, the British Surveyor General of India. Waugh chose to name the mountain after George Everest. 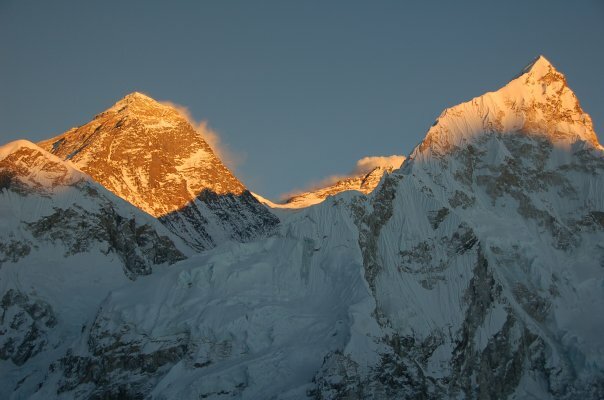 In the early 1960s, the Nepalese government gave Mount Everest the official name Sagarmatha . This name had not previously been used; the local inhabitants knew the mountain as Chomolungma . The mountain was not known and named in ethnic Nepal (that is, the Kathmandu valley and surrounding areas). The government set out to find a Nepalese name for the mountain because the Sherpa/Tibetan name Chomolangma was not acceptable, as it would have been against the idea of unification (Nepalization) of the country. The Mount Everest region, and the Himalayas in general, are thought to be experiencing ice-melt due to global warming. Mt. Everest has two main climbing routes, the southeast ridge from Nepal and the northeast ridge from Tibet, as well as many other less frequently climbed routes. Of the two main routes, the southeast ridge is technically easier and is the more frequently-used route. It was the route used by Edmund Hillary and Tenzing Norgay in 1953 and the first recognised of fifteen routes to the top by 1996. From Camp I, climbers make their way up the western base of the Lhotse face, where Camp II or Advanced Base Camp (ABC) is established at 6,500 m (21,300 ft). The Western Cwm is a relatively flat, gently rising glacial valley, marked by huge lateral crevasses in the centre which prevent direct access to the upper reaches of the Cwm. Climbers are forced to cross on the far right near the base of Nuptse to a small passageway known as the "Nuptse corner". The Western Cwm is also called the "Valley of Silence" as the topography of the area generally cuts off wind from the climbing route. The high altitude and a clear, windless day can make the Western Cwm unbearably hot for climbers. From Camp IV, climbers will begin their summit push around midnight with hopes of reaching the summit (still another 1,000 metres above) within 10 to 12 hours. Climbers will first reach "The Balcony" at 8,400 m (27,600 ft), a small platform where they can rest and gaze at peaks to the south and east in the early dawn light. Continuing up the ridge, climbers are then faced with a series of imposing rock steps which usually forces them to the east into waist deep snow, a serious avalanche hazard. At 8,750 m (28,700 ft), a small table-sized dome of ice and snow marks the South Summit. Hillary and Tenzing were the first climbers to ascend this step and they did it with primitive ice climbing equipment and without fixed ropes. Nowadays, climbers will ascend this step using fixed ropes previously set up by Sherpas. Once above the step, it is a comparatively easy climb to the top on moderately angled snow slopes - though the exposure on the ridge is extreme especially while traversing very large cornices of snow. With increasing numbers of people climbing the mountain in recent years, the Step has frequently become a bottleneck, with climbers forced to wait significant amounts of time for their turn on the ropes, leading to problems in getting climbers efficiently up and down the mountain. After the Hillary Step, climbers also must traverse a very loose and rocky section that has a very large entanglement of fixed ropes that can be troublesome in bad weather. Climbers will typically spend less than a half-hour on "top of the world" as they realize the need to descend to Camp IV before darkness sets in, afternoon weather becomes a serious problem, or supplemental oxygen tanks run out. The northeast ridge route begins from the north side of Everest in Tibet autonomus region of peoples republic of China. Expeditions trek to the Rongbuk Glacier, setting up Base Camp at 5,180 m (16,990 ft) on a gravel plain just below the glacier. To reach Camp II, climbers ascend the medial moraine of the east Rongbuk Glacier up to the base of Changtse at around 6,100 m (20,000 ft). Camp III (ABC - Advanced Base Camp) is situated below the North Col at 6,500 m (21,300 ft). To reach Camp IV on the north col, climbers ascend the glacier to the foot of the col where fixed ropes are used to reach the North Col at 7,010 m (23,000 ft). From the North Col, climbers ascend the rocky north ridge to set up Camp V at around 7,775 m (25,500 ft). The route crosses the North Face in a diagonal climb to the base of the Yellow Band reaching the site of Camp VI at 8,230 m (27,000 ft). From Camp VI, climbers will make their final summit push. Climbers face a treacherous traverse from the base of the First Step: 27,890 feet - 28,000 feet, to the crux of the climb, the Second Step: 28,140 feet - 28,300 feet. (The Second Step includes a climbing aid called the "Chinese ladder", a metal ladder placed semi-permanently in 1975 by a party of Chinese climbers. It has been almost continuously in place since, and is used by virtually all climbers on the route.) Once above the Second Step the inconsequential Third Step is clambered over: 28,510 feet - 28,870 feet. Once above these steps, the summit pyramid is climbed by means of a snow slope of 50 degrees, to the final summit ridge along which the top is reached. In 1885, Clinton Thomas Dent, president of the Alpine Club, suggested that climbing Mount Everest was possible in his book Above the Snow Line . The British returned in 1922. George Finch ("The other George") climbed using oxygen for the first time. He ascended at a remarkable speed — 950 feet (290 m) per hour, and reached an altitude of 8,320 m, the first time a human climbed higher then 8,000m. This feat was entirely lost on the British climbing establishment — except for its "unsporting" nature. Mallory and Col. Felix Norton made a second unsuccessful attempt. Mallory was faulted for leading a group down from the North Col which got caught in an avalanche. Mallory was pulled down too, but seven native porters were killed. In 1933, Lady Houston, a British millionaire ex-showgirl, funded the Houston Everest Flight of 1933 , which saw a formation of aircraft led by the Marquess of Clydesdale fly over the summit in an effort to deploy the British Union Flag at the top. Early expeditions — such as Bruce's in the 1920s and Hugh Ruttledge's two unsuccessful attempts in 1933 and 1936 — tried to make an ascent of the mountain from Tibet, via the north face. Access was closed from the north to western expeditions in 1950, after the Chinese asserted control over Tibet. In 1950, Bill Tilman and a small party which included Charles Houston, Oscar Houston and Betsy Cowles undertook an exploratory expedition to Everest through Nepal along the route which has now become the standard approach to Everest from the south. On 14 May 2005, pilot Didier Delsalle of France landed a Eurocopter AS 350 B3 helicopter on the summit of Mount Everest . (without any witness) and took off after about four minutes. (His rotors were continually engaged, constituting a "hover landing", and avoiding the risks of relying on the snow to support the aircraft.) He thereby set rotorcraft world records, for highest of both landing (de facto) and take-off (formally). Much of this controversy was captured by the Discovery Channel while filming the television program Everest: Beyond the Limit . A crucial decision affecting the fate of Sharp is shown in the program, where an early returning climber (Max Chaya) is descending and radios to his base camp manager (Russell Brice) that he has found a climber in distress. He is unable to identify Sharp, and Sharp had chosen to climb solo without any support, so he did not identify himself to other climbers. The base camp manager assumes that Sharp is part of a group that has abandoned him, and informs his climber that there is no chance of him being able to help Sharp [at 8000+ meters in altitude, barely anyone has the strength to help another man who is only semi conscious, and Max Chaya is only an amateur mountaineer]. As Sharp's condition deteriorates through the day and other descending climbers pass him, his opportunities for rescue diminish: his legs and feet curl from frost-bite, preventing him from walking; the later descending climbers are lower on oxygen and lack the strength to offer aid; time runs out for any Sherpas to return and rescue him. Most importantly, Sharp's decision to forgo all support leaves him with no margin for recovery. Peoples republic of China paved a 130 km (81 mi) gravel road from Tingri County to its Base Camp in order to accommodate growing numbers of climbers on the north side of the mountain. It will become the highest asphalt-paved road in the world. Construction began on 18 June 2007 at a cost of 150 million yuan (US$19.7 million). China also routed the 2008 Olympic Torch Relay over Everest, going up the South Col route and back down the North Col route, on the way to the 2008 Summer Olympics in Beijing. A China Telecom cellular tower near the Base Camp provides phone coverage all the way to the summit. As part of Everest Skydive 2008, an event of twenty-nine skydivers, three internationally known parachutists became the first to skydive above Everest. Neil Jone, Holly Budge and Wendy Smith were flown to 29,500 feet, 2,500 feet above Everest. From there, they jumped in their thermal suit, oxygen tank and extra-thick parachutes landing back at Shyangboche airport 12,350 feet below. One sometimes deadly phenomenon, however, does not plague climbers as it usually does on mountains — lightning. Lightning does not strike Mount Everest. NASA's lightning detection system does record significant lightning in the Tibet plateau, but none along the high Tibetan mountains, from about 2,000 m (7,000 ft) and above. The 1996 disaster also introduced the issue of the guide's role in using bottled oxygen. Guide Anatoli Boukreev's decision not to use bottled oxygen was sharply criticized by Jon Krakauer. Boukreev's supporters (who include G. Weston DeWalt, who co-wrote The Climb ) state that using bottled oxygen gives a false sense of security. Krakauer and his supporters point out that, without bottled oxygen, Boukreev was unable to directly help his clients descend. They state that Boukreev said that he was going down with client Martin Adams, but just below the South Summit, Boukreev determines that Adams was doing fine on the descent and so descends at a faster pace, leaving Adams behind. Adams states in The Climb : "For me, it was business as usual, Anatoli's going by, and I had no problems with that." Euophrys omnisuperstes , a minute black jumping spider, has been found at elevations as high as 6,700 metres (22,000 ft), possibly making it the highest confirmed permanent resident on Earth. They lurk in crevices and possibly feed on frozen insects that have been blown there by the wind. It should be noted that there is a high likelihood of microscopic life at even higher altitudes. Birds, such as the bar-headed goose, have been seen flying at the higher altitudes of the mountain, while others such as the Chough have been spotted as high as the South Col (7,920 m), scavenging on food, or even corpses, left over by climbing expeditions. Geologists have subdivided the rocks comprising Mount Everest into three units called "formations". Each of these formations are separated from each other by low-angle faults, called “detachments”, along which they have been thrust over each other. From the summit of Mount Everest to its base these rock units are the Qomolangma Formation, the North Col Formation, and the Rongbuk Formation. From its summit to the top of the Yellow Band, about 8,600 m above sea level, the top of Mount Everest consists of the Qomolangma Formation, which has also been designated as either the Everest Formation or Jolmo Lungama Formation. It consists of grayish to dark gray or white, parallel laminated and bedded limestone interlayered with subordinate beds of recrystallized dolomite with argillaceous laminae and siltstone. Gansser reported finding visible fragments of crinoids in these limestones. Petrographic analysis of samples of this Ordovician limestone from near the summit revealed them to be composed of carbonate pellets and finely fragmented remains of trilobites, crinoids, and ostracods. Other samples were so badly sheared and recrystallized that their original constituents could not be determined. The Qomolangma Formation is broken up by several high-angle faults that terminate at the low angle thrust fault, the Qomolangma Detachment. This detachment separates it from the underlying Yellow Band. The lower five metres of the Qomolangma Formation overlying this detachment are very highly deformed. The bulk of Mount Everest, between 7,000 and 8,600 m, consists of the North Col Formation, of which the Yellow Band forms its upper part between 8,200 to 8,600 m. The Yellow Band consists of intercalated beds of diopsite-epidote-bearing marble, which weathers a distinctive yellowish brown, and muscovite-biotite phyllite and semischist. Petrographic analysis of marble collected from about 8,300 m found it to consist as much as five percent of the ghosts of recrystallized crinoid ossicles. The upper five metres of the Yellow Band lying adjacent to the Qomolangma Detachment is badly deformed. A 5–40 cm thick fault breccia separates it from the overlying Qomolangma Formation. The remainder of the North Col Formation, exposed between 7,000 to 8,200 m on Mount Everest, consists of interlayered and deformed schist, phyllite, and minor marble. Between 7,600 and 8,200 m, the North Col Formation consists chiefly of biotite-quartz phyllite and chlorite-biotite phyllite intercalated with minor amounts of biotite-sericite-quartz schist. Between 7,000 and 7,600 m, the lower part of the North Col Formation consists of biotite-quartz schist intercalated with epidote-quartz schist, biotite-calcite-quartz schist, and thin layers of quartzose marble. These metamorphic rocks appear to the result of the metamorphism of deep sea flysch composed of interbedded, mudstone, shale, clayey sandstone, calcareous sandstone, graywacke, and sandy limestone. The base of the North Col Formation is a regional thrust fault called the “Lhotse detachment”. Below 7,000 m, the Rongbuk Formation underlies the North Col Formation and forms the base of Mount Everest. It consists of sillminite-K-feldspar grade schist and gneiss intruded by numerous sills and dikes of leucogranite ranging in thickness from one cm to 1,500 m.
6 (six ) nights hotel in Kathmandu on BB basis. Round trip airfare to & from Lukla. Excess baggage and domestic airport taxes. Walkie-talkie set to each client with radio base & accessories. All necessary climbing hardware gears with fixed ropes. All necessary camping and kitchen gears. All airport transport & celebration meal in Kathmandu . Major meals in Kathmandu .